Saving Private Ryan is considered more than just one of director Steven Spielberg’s best films. Many critics and moviegoers alike rank it as one of the best war movies ever made. It won five Oscars in 1998, and a Golden Globe for Best Motion Picture–Drama. The film stars Tom Hanks, and Matt Damon in the titular role. 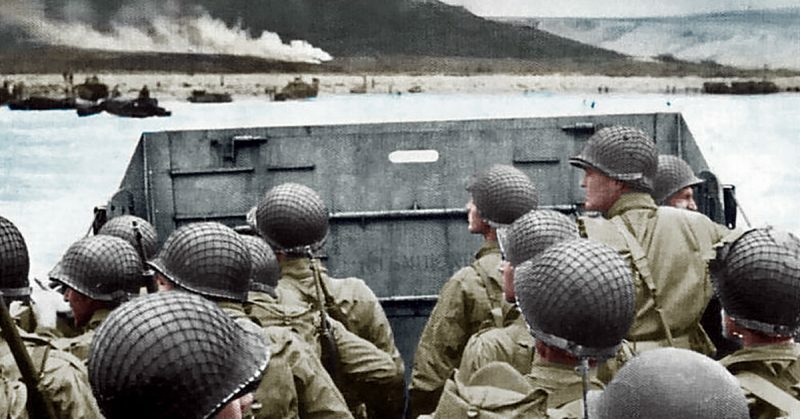 It depicts the invasion of Normandy during World War II, particularly the landing at Omaha Beach where thousands of troops merged to tackle German forces, in what was a decisive act of victory for Allied forces. 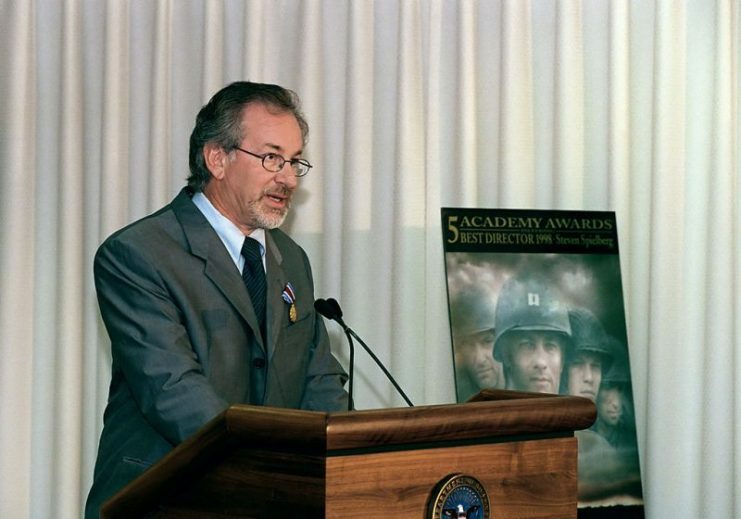 Director Steven Spielberg speaking at the Pentagon on August 11, 1999. But WWII buffs and movie enthusiasts alike have caught several gaffes, some minor and some not, in the film’s battle scenes. Some are subtle, others leap off the screen–but all are fun to take note of, and prove that even a director of Spielberg’s caliber and fame can slip up. In fairness, it must be noted that the pace, action and drama of the film make it almost impossible to catch these slips on first viewing. So if ever an excuse is needed to indulge a desire to watch Saving Private Ryan again, this is it. In one scene, Allied soldiers consult with map experts and translators to decide their next move. One soldier becomes frustrated and trashes his desk, throwing everything to the ground. When ready to leave, he realizes he has picked up the wrong helmet, and turns back to retrieve his own. Somehow, all the items he had tossed to the ground are back on the desk. 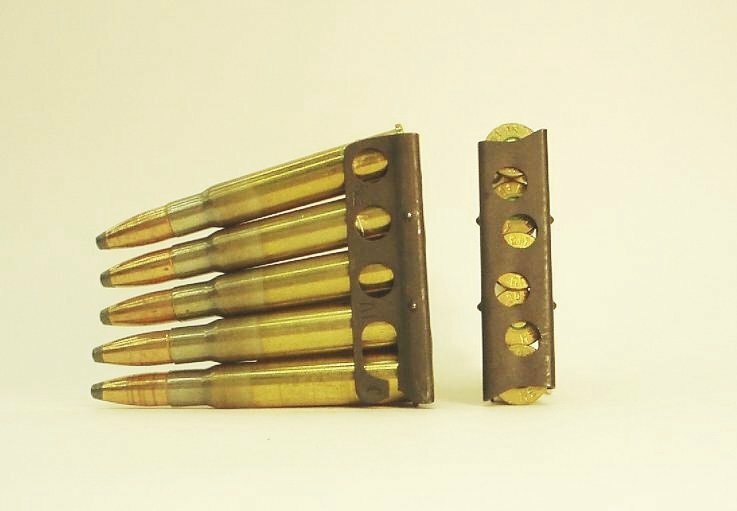 Bullet pack similar to the one used on the film set. Another soldier clearly has a “bullet pack” in his uniform’s left breast pocket, but when he is shot only seconds later, the charge explodes from that very spot. 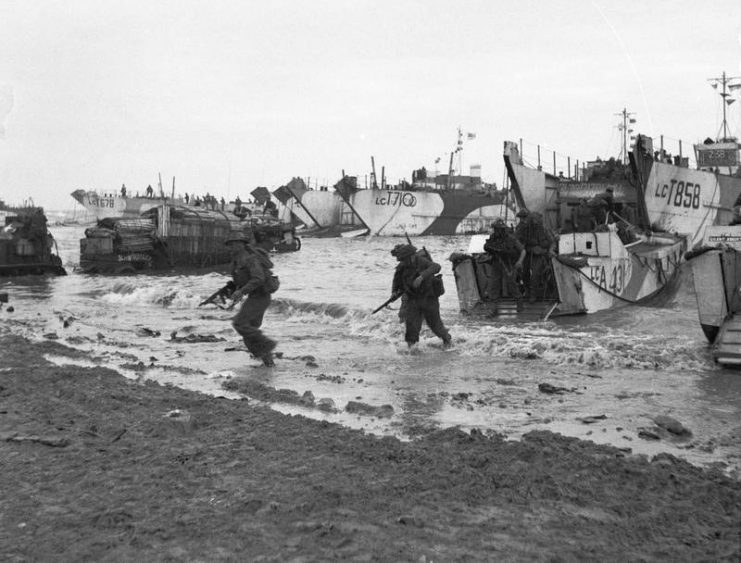 When the troops are coming from the sea, led by Captain Miller (Hanks), they are hit by mortar fire and Hanks falls face forward into filthy, bloody water. When he struggles to his feet, his face is, oddly, perfectly clean. Clearly these moments were shot in several takes. Another scene clearly shot in several takes is one in which a soldier’s uniform changes color mid-scene. When he places a bomb on a tank, his uniform is beige, and when he dies from its explosion, he is wearing dark green. In another scene, it is the soldier’s wound that changes. First it’s there, and only moments later it has vanished. Another man’s wound is revealed too much, all the way down to the chest prosthetic the actor is wearing. Other small slips are more explainable, but still seem to defy the normal constraints of time and space. One moment a soldier is right beside his comrade, but in the next frame he is more than two feet away. One soldier uses his right hand to kiss his crucifix, but only a fraction of a second later, his gun is in that hand. These are mostly trivial and understandable oversights. The chaos of film making cannot be compared to the chaos of war, of course, but nonetheless it is incredibly difficult to wrangle a huge cast and shoot consistent scenes that depend on the most minute details. One error near the end is indeed rather stark, however. When Hanks’ character has been killed, his helmet lies beside him, on the ground. When we see the scene from “Private Ryan’s” perspective, over his shoulder, the helmet has turned upside down. That’s a rather large oversight in the film, and whoever was responsible for ensuring continuity on the shoot likely got in trouble for it. 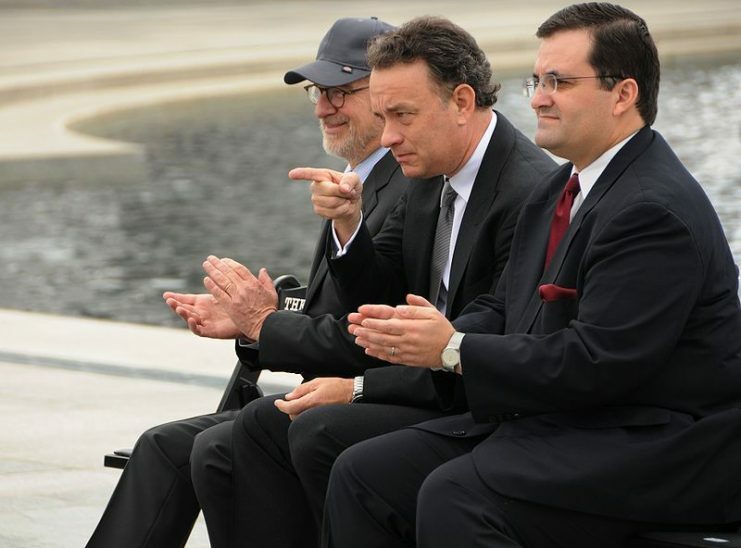 Hanks with Steven Spielberg at the National World War II Memorial in March 2010. Even so, Saving Private Ryan is a classic. No film is perfect, because flaws are an inherent part of film making, particularly when done outdoors. The weather and oceans can’t be dictated to, any more than the shifting sands on a beach can be. So considering all the natural elements that could have conspired against Spielberg on that shoot, he and his colleagues did a remarkable job. Watching a film for its mistakes can be fun, but Saving Private Ryan should be watched because it is a film not only about how the Allies won, but equally also about what they lost: thousands and thousands of men.